What are the physical properties of Jupiter? Jupiter is by far the largest planet in our solar system. It is about twice as massive as all the other planets, moons, and asteroids in our solar system put together. However, its day is only ten hours long, less than half an Earth day. The fifth planet out from the Sun, Jupiter is 1,300 times Earth’s volume and 320 times Earth’s mass. Most of Jupiter’s mass consists of swirling gases, mostly hydrogen and helium; in this incredibly thick, dense atmosphere, storms of incredible magnitude rage and swirl. 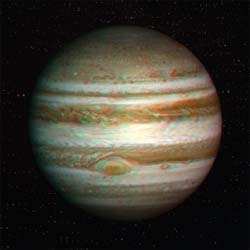 The largest of these storms is the Great Red Spot, which is often visible from Earth through even a small telescope. Jupiter has a rocky core made of material thought to be similar to Earth’s crust and mantle. However, this core may be the size of our entire planet, and its temperature may be as high as 18,000 degrees Fahrenheit (10,000 degrees Celsius), with pressures equal to two million Earth atmospheres. Around this core, in these extreme conditions, it is likely that a thick layer of liquid hydrogen is present; at least some of the hydrogen in this layer conducts electricity like metal does, and is possibly the cause of Jupiter’s intense magnetic field, which is five times greater than even that of the Sun. At least sixty moons orbit Jupiter. Many of them are only a few miles across and are probably captured asteroids. However, four of them—Io, Europa, Ganymede, and Callisto—are about the size of Earth’s Moon or larger. Jupiter is the largest of the four gas giants in our solar system. In fact, if Jupiter, which is made up mostly of hydrogen and helium, had been very much larger when the solar system formed, it could have become a star and Eartl would have been part of a binary star system.